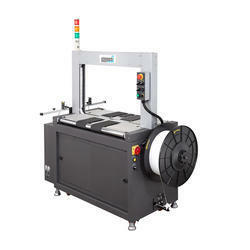 Strapping Machines-Automatic offered by us are fabricated with the latest tools and technology. Our range of products are widely used for strapping cartons of various heights without the usage of tools and equipment. We also provide customization facility as per the needs and requirements of our clients. The products manufactured ensures high-grade quality as they are made with standardized materials obtained from the trusted and authenticated vendors which are highly quality tested before the final delivery. We are a coveted firm widely engaged in bringing forth the clients an excellent assortment of Side Seal Fully AutomaticMachine. The offered range is widely used in fully automatic conveyor lines for strapping furniture, refrigerators and other bulky objects. For flexibility of operation, the range is incorporated with a sealing head place on the side of the housing. Also designed as per the CE safety standards, the range offers low voltage microprocessor controls. 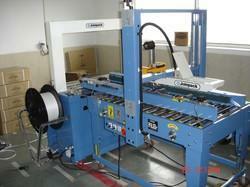 Applications: Fully Automatic Conveyor Line For Strapping Furniture, Refrigerators And Bulky Objects., Etc. Sealing head place on side of housing for most flexibility on-line with conveyor. We have been able to cater diverse needs of our clients, owing to the vast industrial experience by providing Fully Automatic Machine With Roller Conveyor Tables. These range of products are ideally applicable in fully automatic conveyor lines and are used to strap and convey heavy packages. Our products are made of high quality steel rollers and the electric box offered by us consists a single photo cell for automatic strapping control. These products are also offered customization as per the clients needs and requirements. Strapping speed approx. 24 straps/min. We have been able to put forth remarkable range of Fully Automatic Belt Driven Machine to our clients with the help of our knowledgeable professionals. 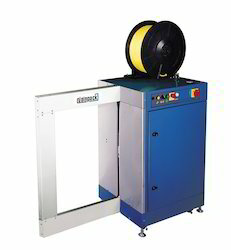 These are ideally used for the strapping of lighter weight or smaller cartons. Our range of products are manufactured maintaining the international standards and are also provided with customization facility as per the clients needs and requirements. Strapping Speed Approx. 24 straps / Min. 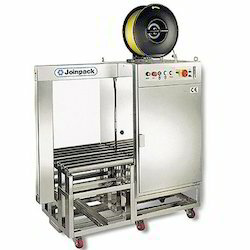 JPM-JOINPACK is a reputed name in the Indian industry widely appreciated for bringing forth the clients an excellent assortment of Fully Automatic Belt Driven Strapping Machine. Manufactured using premium quality raw material, our range is appreciated by the clients for its attributes such as sturdy construction, smooth functioning, accuracy, strength and adjustable operations. The offered range can also be availed in customized specifications as per the requirement s of the customers. 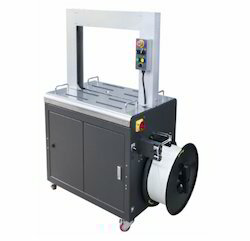 We have been able to offer a commendable range of Narrow Strap Automatic Strapping Machines with the help of vast industrial experience. These products are made with premium quality raw-materials and advanced tools and technique integrated with the motor driving system for smooth functioning. 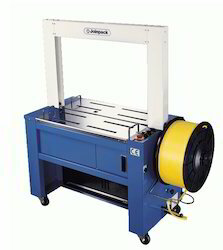 We are engaged in offering high quality Marine Type Strapping Machines. Marine or meat pharmaceutical industry excellent for dusty conditions. #304 stainless steel for housing, arch cover, accessories in arch group and electric box roller table. Hand and foot control strapping switch. 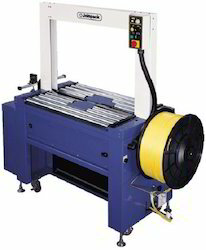 Owing to our expertise in the domain, we have been able to offer a comprehensive range of Low Table Strapping Machines. Our offered range is quality tested and has been passed on various parameters. 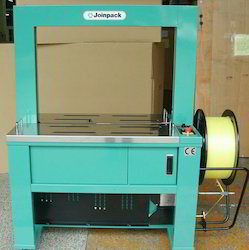 The machine with very low table is suitable for the packages that are very large or heavy such as Automobile industries. 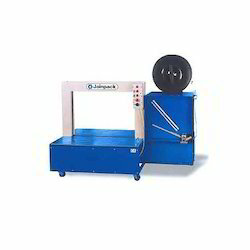 Automatic Strapping Machine offered by us are of excellent quality and are highly acknowledged by our clients for its corrosion resistance, better service lives and sturdiness. These are manufactured using advanced quality raw-materials and our products are stringently quality tested under various parameters. Our unique designs leads in easy insertion hence resulting in faster operation and are safer in efforts.